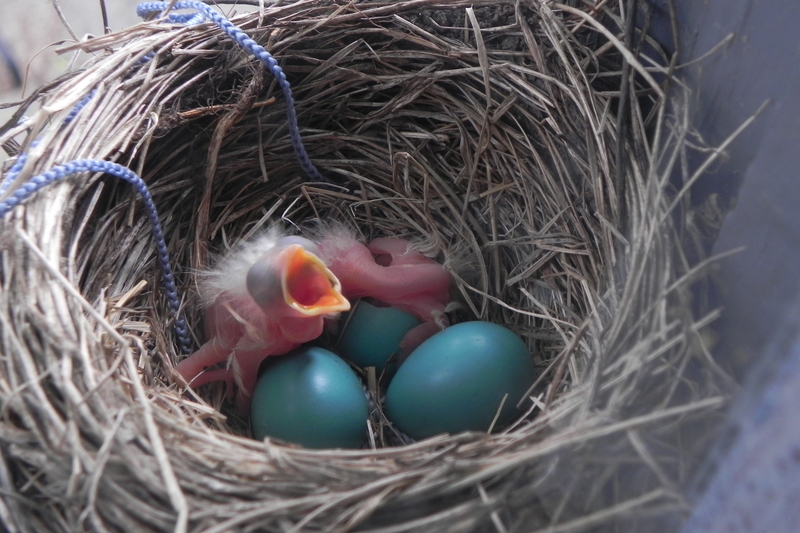 Last spring, I watched Mrs. Robin build her nest and lay her eggs, and then followed their progress until the fledglings left the nest. It’s hard for me to imagine any of them being shot for sport. I was visiting with friends recently when one of the kids – we’ll call him Joey – came from behind the house to ask a question. “Dad, can I shoot a woodcock?” The youngster, about 10 years old, had a BB gun and had apparently spent the morning shooting birds. He shrugged again and gave me a look like I’d just asked a really stupid question. Truth be told, I’m not a fan of shooting birds – or deer or bears or fox or coyote or any other living creature, at least not for sport. If you’re using an animal for food, that’s a “circle of life” kind of thing and, I think, a different discussion. But to shoot an animal to hang its head on the wall or take a trophy photo and leave the carcass where it landed? Not a fan. Of course, I didn’t grow up in the country, so whenever I question shooting birds or squirrels, I get a lot of flack (often with eye rolls) from people who did about how I don’t understand country living. Maybe I don’t. There’s a part of me that’s bothered by a kid who kills a bird for fun. Is that a sign of dangerous behavior to come down the road? Or maybe it’s only the kids who pull the wings off flies who end up serial killers? There’s a greater analogy in there, but still, the cinematic model of morality was giving the go ahead to kill blue jays. Once upon a time, it was a rite of passage for a kid to get a BB gun and shoot targets, tin cans and other stuff, critters included. So the question I’m left struggling with today: is it OK for kids to shoot birds with BB guns? Where do you draw the line between sport and cruelty – and is there even a line to identify? I’d love to hear your thoughts. And if you want to see the photos from last spring of Mrs. Robin and her babies, you can check them out here. 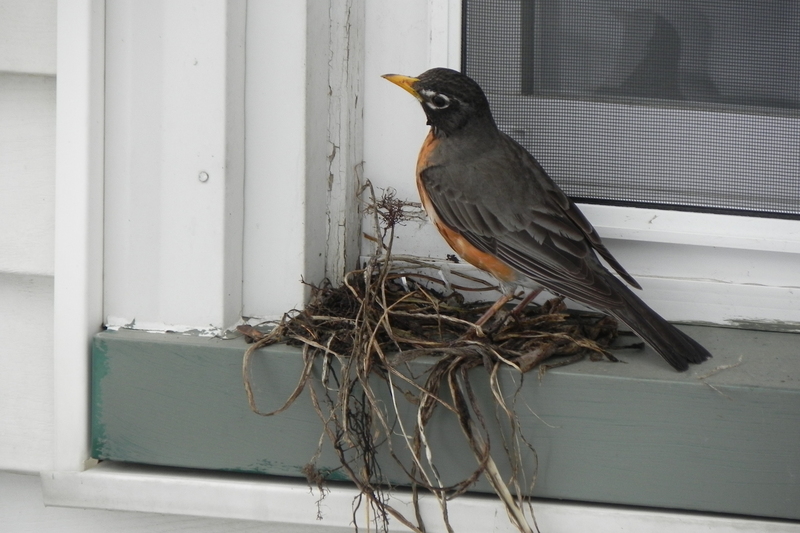 After a week, Mrs. Robin finally has a secure nest – with a little help from darling husband. 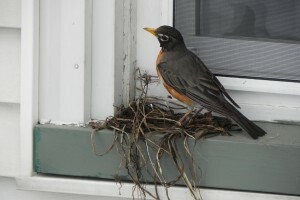 Over on my blog at Patheos.com, I mused yesterday on the journey of a robin trying – and failing – to build a nest, first in our neighbor’s window and then in our garage window. It’s been a week and each nest attempt has been blown away. But yesterday, she picked a new spot and with a bit of help from darling husband, it looks like she’s on her way to setting up home sweet home. 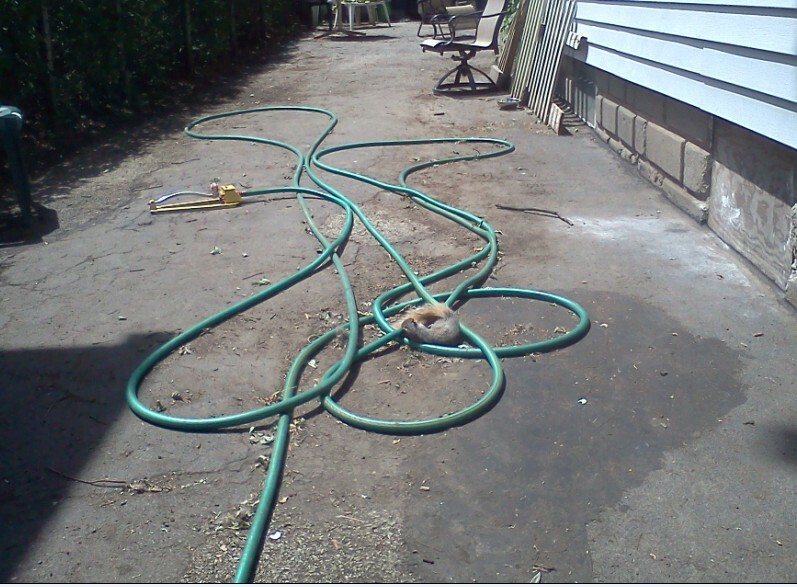 You can read the whole post at Patheos – but her story offers up a lesson in failure and perseverance. Sometimes I’ve felt like, when I fail, it’s a message from God to quit trying to do what I’m doing, because it’s not his plan. Other times, I’ve abided by the adage that if at first you don’t succeed, try again, because God is just testing your faith. And yes, I’m slightly screwed up by it all: I suffer from a terminal case of paralysis by analysis. No matter what I want to do, feel called to do, or am asked to do, I question and analyze and weigh the pros and cons until I don’t know what to do. So I do nothing. But there’s Mrs. Robin, meeting challenge after challenge, and when that happens she just picks up and starts over. I think there’s a lesson in there about just getting up each morning and doing what you’re supposed to do that day. Less questioning, more doing. This is one lesson that I’ve got in my head but have to work at every day to put into practice. I might have had trouble going back to sleep, but Bailey was sound asleep on a pile of blankets. 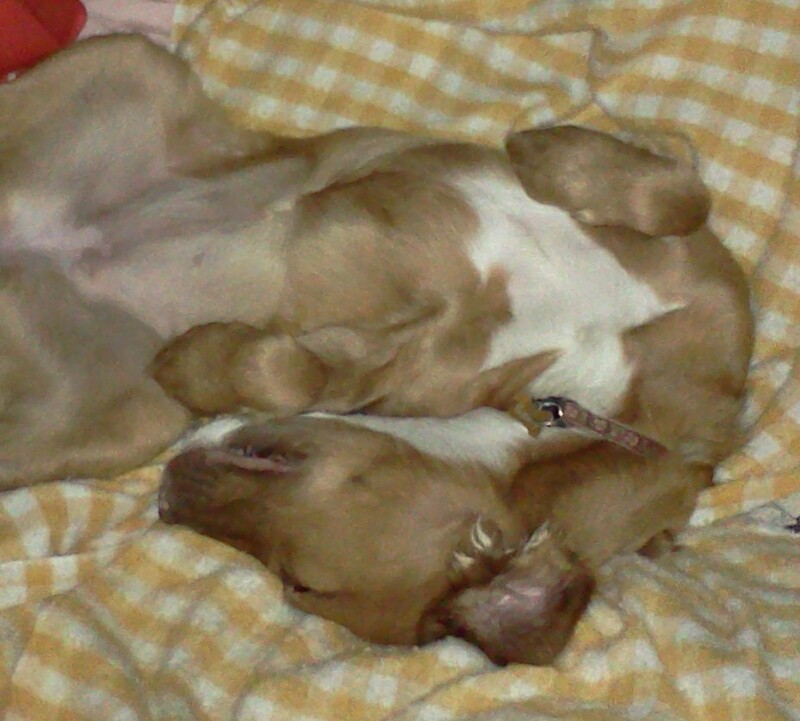 Oh, to sleep like a puppy! I was talking to a friend recently – let’s call him Mike – about his job producing a local morning news program. He said he’s up at 3 AM, in a production meeting by 4 AM, and then writing news and doing whatever it is that news producers do to get the show on the air. I’m familiar with 3 AM. 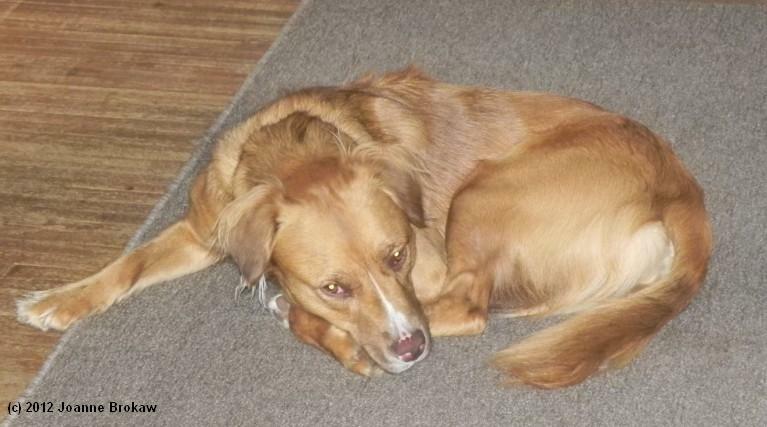 It’s usually the time that the dogs need to go out to potty, a holdover from house training days when the little bundle of puppy love couldn’t make it through the night. We get up, we go out, they do their thing, and we’re back in bed. For those five minutes, I’m just barely out of REM sleep. So I’m just amazed that Mike actually gets up at the same time and starts his work day. The thing that’s the weirdest about getting up that early, he told me, is that the birds are chirping, even though it’s pitch dark out. And with that one comment, my entire sleep cycle has been ruined. This morning, I took the dogs out at our usual time. Same routine as always. But this time when I laid my head on my pillow, I heard it: a bird chirping. How have I never heard the birds chirping at this hour? I thought to myself. I mean really, what do they birds do at that time of the morning? They can’t see in the dark, can they? Can they smell worms? I know I can smell worms when it rains. But we haven’t had any rain. These are the thoughts that started running through my mind. And it was downhill from there. I can’t believe people get up this early in the morning to go to work. I suppose the upside is that there’s no traffic. I’m so glad I don’t have a real job. I mean, good grief, how can you be awake enough to write news copy … write … write … oh, crap, I think I have a column due. What day is it? Is it the 15th yet? … the 15th … did I pay the mortgage? I don’t think I paid the mortgage. Is there even enough in the account to pay the mortgage? Oh god, I need to get a job. A real job, with a real paycheck. Oh wait, I already tried that. Didnt work. I’m such a loser. I can’t believe what a loser I am. OK, I should really get up right now. Right now, go write or clean or do something productive, since I’m awake. What time is it, 4 AM? It’s 4:30 AM? How did an hour and a half pass? Whatever, I should get up and go downstairs and try to get some writing done while the dogs are all asleep. That’s what I should do. Get up. Although I am still tired. I just can’t fall back to sleep. OK, get up. Get up now. Go write that column. What should I write about? Grrr, just get up or go back to sleep, but don’t lie here thinking about sleeping. Good grief, those birds are loud. If I don’t fall back to sleep right now the neighborhood will start waking up and the dogs will wake up and I’ll never get back to sleep. How can it be 5:30 AM already? OK, just get up. Did I put the laundry in the dryer last night? It’s going to be stinky in the washer and I’ll have to rewash it. I hate this heat. It’s so hot. Except this fan is really annoying. It’s blowing on my head. I’m cold. And one of these dogs stinks. They all need to get baths today. OK, let’s put that on the to do list. Write, give the dogs baths. And what else? Oh god, I am a loser. My days are filled with … nothing. Why even bother to get up at all? And the next thing I knew, it was 9:30 AM. Well, between 5:30 and 9:30 I was aware of dogs breathing in my face and one puppy chewing my shoes. But I lost two and a half crucial hours in the middle of my sleep cycle and now I’m all off kilter. I blame it all on that stupid bird. And Mike, who pointed it out. 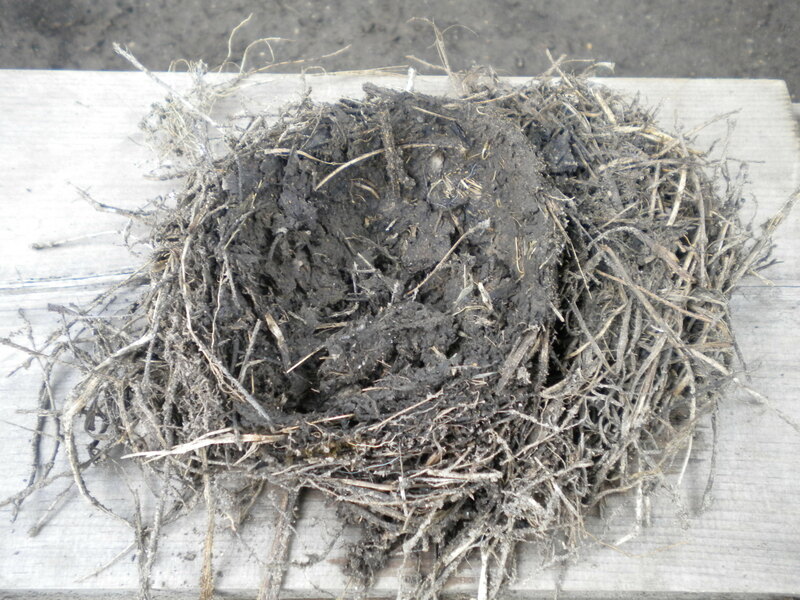 During last night’s rain storm, a bird’s nest apparently was blown out of one of the trees in our backyard. Incredible, isn’t it? The way a bird, without the aid of any tools other than its beak, can craft a home like this. Round, sturdy (although it wasn’t a match for last night’s wind, when it landed in the driveway it was virtually intact save some of the outer shell), and surprisingly neat. While I, with the aid of modern technology and housekeeping tools the founding women would have killed for, still have a cluttered, messy home. Laundry never quite caught up. Dishes in the drainer. Kitchen table piled high with books and papers. Floors filthy with paw prints no matter how much I sweep or mop. And yet … both are home sweet home. My chicken catching skills came in handy today when I met my friend Robbi for breakfast at Panera. While we were sitting there talking, a bird flew by. Inside the restaurant. Robbi turned to me and ask, “Did I just see what I think I saw?” Yup. And it was so funny I laughed out loud. Loudly out loud.